Something is desperately wrong with most churches today. Many sincere followers of Christ who are passionate for God and his work are unaware of the crucial link between emotional health and spiritual maturity. Something is desperately wrong with most churches today. Many sincere followers of Christ who are passionate for God and his work are unaware of the crucial link between emotional health and spiritual maturity. They present themselves as spiritually mature but are stuck at a level of immaturity that current models of discipleship have not addressed. Discipleship that really transforms a church must integrate emotional health with spiritual maturity. 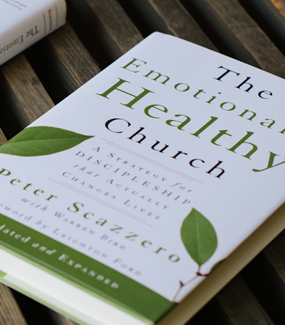 The Emotionally Healthy Church, winner of the Gold Medallion Book Award, offers a strategy for discipleship that accomplishes healthy living and actually changes lives. This book may also be purchased through Barnes and Noble.com, Amazon.com and Christianbooks.com. Published by Zondervan 2003.